Situated just 13 km from the West Entrance to Glacier National Park and offering scenic sunset mountain views this century-old lodge is located in Hungry Horse Montana. A seasonal on-site restaurant and espresso bar are featured at Historic Tamarack Lodge and Cabins. Complete with a microwave all accommodations here include a refrigerator a dining area and a private bathroom with a bath or shower. The bungalows boast fully equipped kitchens. 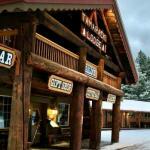 At Historic Tamarack Lodge and Cabins guests will find a gift shop and an on-site bar. Barbecue facilities a covered pavilion fire pits and outdoor games are also available here. Columbia Falls is a 10-minute drive from the lodge. Glacier Park International Airport is 25 km away.